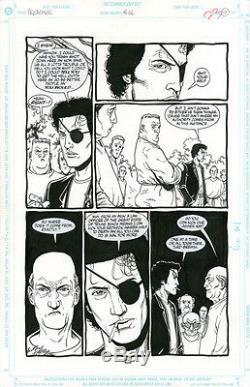 This is a great page, with Jesse Custer in all but one panel and featuring a use of The Word. Page is pen & ink on paper (11 x 17 inches), excellent condition. All kinds of great artists here. West & east, BRITS, SCOTS, IRISH, WELSH, etc.. The item "STEVE DILLON Preacher #46 p17 ORIGINAL COMIC ART Garth Ennis" is in sale since Monday, August 29, 2016.